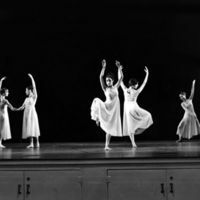 Orchesis attempts to introduce students to the broadest opportunities possible for active participation in the various forms of dance. 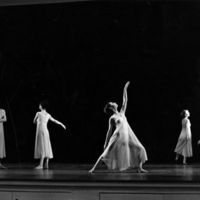 Students work with visiting artists; attend performances in other venues; study in New York City; engage in choreographic projects; work in the community to educate and develop an audience for dance; gain experience in lighting, sound and costume design – all technical aspects of performance. 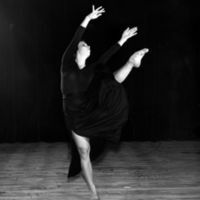 Wilson College student perform as a duo in "Satori" as a part of the Orchesis dance troupe. 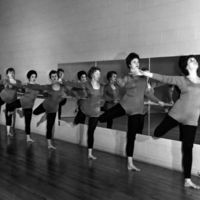 Wilson College students perform in "Mobile" as the Orchesis dance troupe. "Being for the Benefit of Beatrice"
Six Wilson College students perform in "Being for the Benefit of Beatrice" as a part of the Orchesis dance troupe. 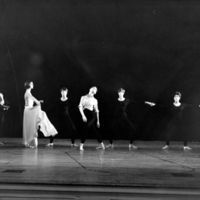 Six Wilson College students point towards the camera as pairs in "Being for the Benefit of Beatrice" as a part of the Orchesis dance troupe. 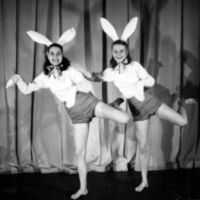 Two members of Wilson College's Orchesis dance wearing bunny costumes. 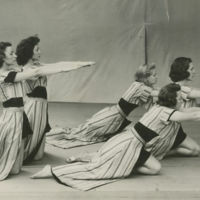 Five members of Wilson College's Orchesis practice a November, 1940 performance. 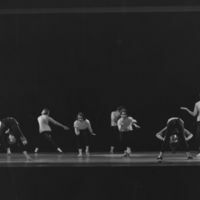 Wilson College's Orchesis students rehearse, three rows are seated on the floor, with their arms extended to their left. "1st Row: Carolyn Buck '54, Sue Yeya '53, Sidney Johnson '54, Eleanor Stiles '54, Joyana Loree '55. 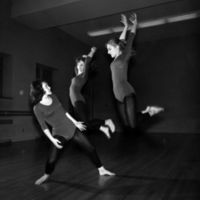 A dance trio from Wilson College's Orchesis. 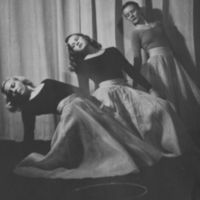 Written caption on back of photo: "L-R Mary Jane Townsend '47, unidentified, Mary Caughey '48"
"A dance recital on an outdoor stage along the banks of the Conococheague." 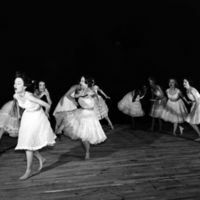 "A dance recital on an outdoor stage along the banks of the Conococheague was presented last (Monday) night at Wilson College as the concluding even of Class Day. 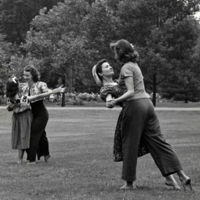 Four unidentified women dance in pairs on Wilson College's campus in the 1950's. 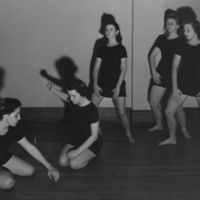 A 1961-1962 dance performance of Wilson College's Orchesis dance troupe, including nine dancers in different poses. 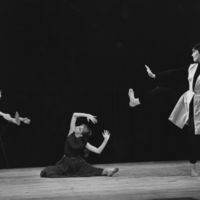 Phoebe Balsley Neville, American choreographer, dancer, educator, and member of Wilson College's class of 1963 performs on March 10, 1962 as a guest. Orchesis members practice their barre work. 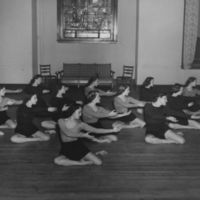 Wilson College students and Orchesis members perform "Dark Vision." 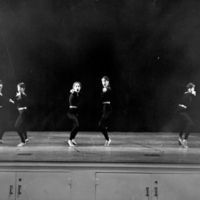 The junior chapter of Wilson College's Orchesis performs "Prelude... To a Party". 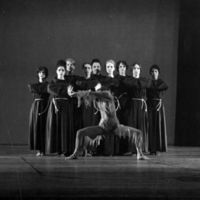 A dress rehearsal for the Orchesis production entitled "Carmina Burana" that was likely set to the scenic cantata composed by Carl Orff in 1935 and 1936, based on 24 poems from the medieval collection of the same name. 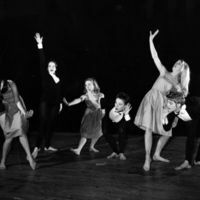 A group of Wilson College students and Orchesis members performance a group dance with props such as LPs, a broom, and a light. 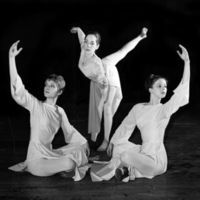 Three Wilson College student perform as a trio in the Orchesis dance troupe in white dresses, 1964. 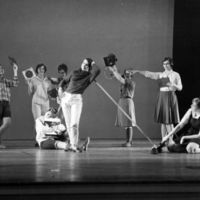 Wilson students perform "the Cocktail Party" at an Orchesis dress rehearsal. 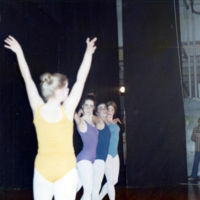 Wilson College students and Orchesis members train as a quartet on stage in different coloured leotards. Wilson College student stretches before a dress rehearsal with Orchesis. 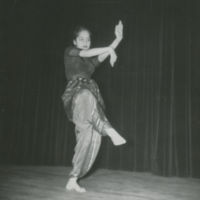 Wilson College student performs a Bharatanatyam. Wilson students rehearse an Orchesis dance troupe performance.